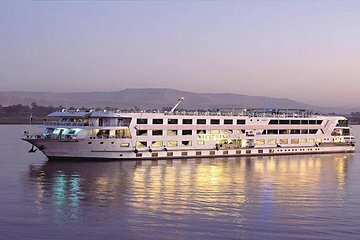 Combine el rico patrimonio cultural de El Cairo con la magia de un crucero de 5 días y 4 noches por el Nilo en este paquete completo de vacaciones en Egipto, una visita obligada para cualquier amante de la historia. En El Cairo, descubra las pirámides de Guiza, el Museo Egipcio y El Cairo copto. En Luxor, podrá ver los templos de Karnak, Luxor y el templo de Hatshepsut, y dar un paseo por el Valle de los Reyes, antes de navegar a Edfu, Kom Ombo y Asuán. La excursión incluye vuelos, hotel y traslados al aeropuerto y la mayoría de las comidas. Sigue el camino de los faraones en las Pirámides y el Valle de los Reyes. Relájese con traslados privados al aeropuerto, hotel y puerto. The scenery is amazing, and the crew on board the ship were incredible. A few little things, though, created some issues: the itinerary failed to mention that we would spend the first full 48 hours of the cruise on a ship that didn't move. Half of the four-day cruise, you spend docked in one spot. Also, our guide assumed we didn't want to spend the extra few bucks to be allowed to take photographs at the Valley of Kings and never gave us that option. That was a bummer. And you may as well take out that "free bottled water" part of your inclusions...That never happened. For a first timer going to Egypt , it was an awesome way to start. Reflection tour organised everything from start to end. Despite a few choppy start with the hotel and cruise, Georgina and her team promptly handled everything professionally. well done. I got a little sick during my tour and my tour guide Mohammed Sayed (they are all Mohammeds :)) had a genuine concern of my wellbeing. Appreciate that. Well Egypt is beautiful and do visit this ancient country. You can do it on your own or with Reflection tour or other tour agency but definitely have a tour guide as there is soo much of history and knowledge to take and certainly enjoy it as I did. Our “once in a lifetime” trip to Egypt was purchased through Viator and was organized in Egypt by Reflections Travel. It has been such an enlightening adventure that we are already planning a return trip. So much history, culture, cuisine and hospitality. We were greeted at the Cairo Airport by a young man with a card with our names on it. After we collected our luggage, he helped us navigate the Egyptian Customs line, purchase our entrance Visas and make our way to the car/ taxi cue. Being driven through Cairo evening traffic was an adventure on its own. Our hotel, arranged by Reflections was the Radisson. We hear it’s one of the nicest hotels in Cairo without being an over the top luxury hotel. The next morning we were met by our first guide and driver. We did everything listed on our tour, Egyptian Museum, Coptic Cairo, Ben Ezra Synagogue and we added Misr al Qadima-Al Dayoura Mosque. Each was historic and described thoroughly by our guide. Later we got to see the Pyramids at Giza. Wow wow wow.The next day we were driven to the airport and flew to Luxor. When we arrived, we were greeted by our guide who would spend the rest of the week with us on the 5 day cruise from Luxor to Aswan, Galal Kayed. He taught us so much more about each temple or tomb than our Lonely Planet travel guide and Egyptian history books. He described the age, context of the Pharaoh or god each site was dedicated to and what has happened since the site was built, expanded or restored and by who. Our river cruise ship was the Nile Marquis and the service and dining was very good.We have had a great trip and have seen more than we can remember but we know there is more to see, learn and experience. We will be back. wonderful experience with friendly highly informed guides. my only suggestion is to schedule visits to these wonderful sites so as to allow more time. My trip was better that I expected. Georgina and her staff took care of every detail to make sure I had everything I needed. Her staff, especially Hesham, Abdul, and Mohammad, were extremely knowledgeable about the history of the sites I visited. They even assist me with items that had nothing to do with this trip. I plan on going back soon.